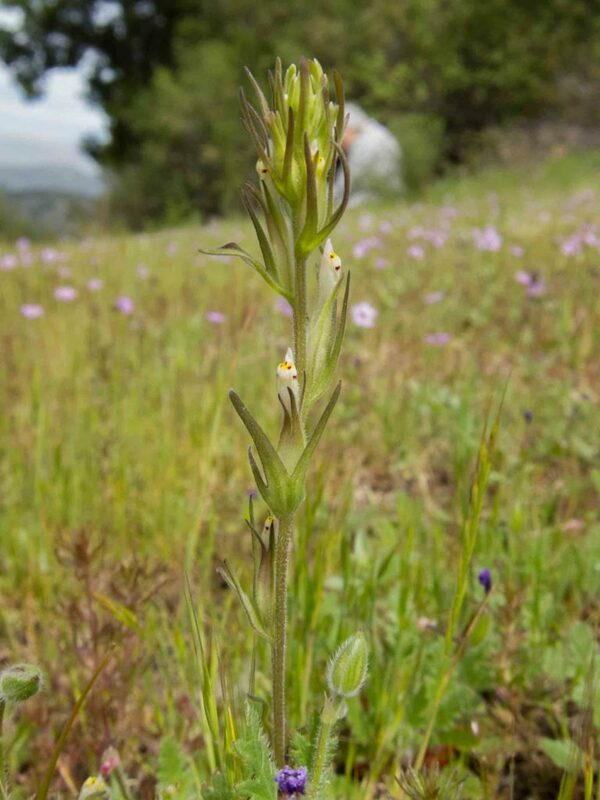 Members of the broomrape family are all parasites. 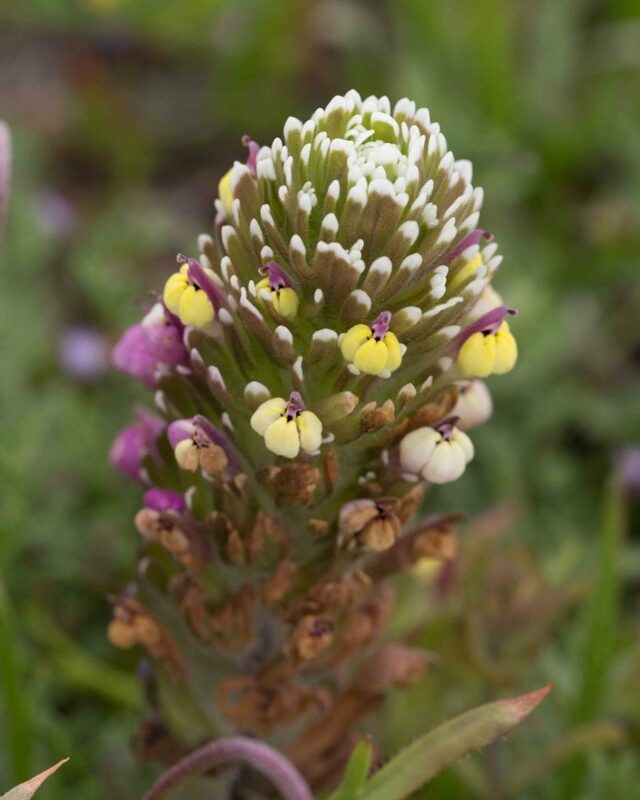 The Orobanche genus is fully parasitic and its members have no green leaves capable of photosynthesis and so providing nutrients to the plant. 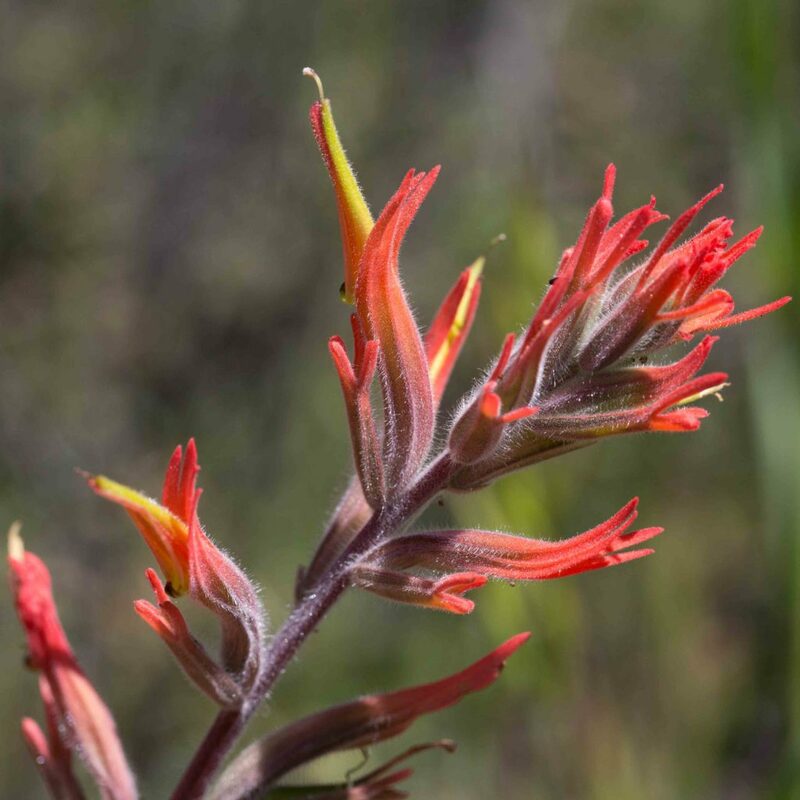 Others, like Castilleja, are hemiparasitic, meaning that they have green leaves capable of photosynthesis but also derive some of their nutrients from the roots of nearby plants. 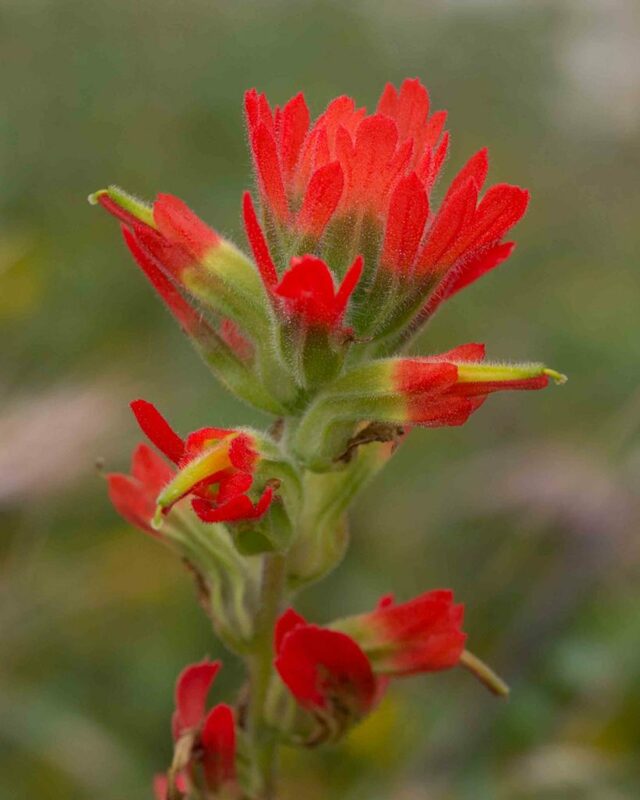 Castilleja fall into two groups, those with bright red, orange or yellow flowers but without a 3-pouched lower lip (the Paintbrushes) and those with a 3-pouched lower lip but flowers which may be one of a variety of colors but not bright red (the Owl’s-clovers). 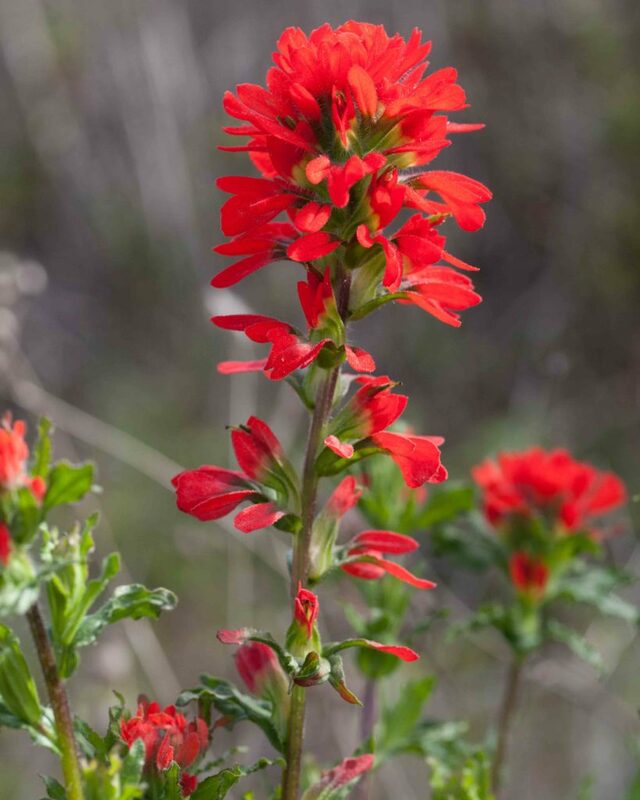 A common paintbrush, especially near the coast with flowers that are generally bright red or reddish-orange. 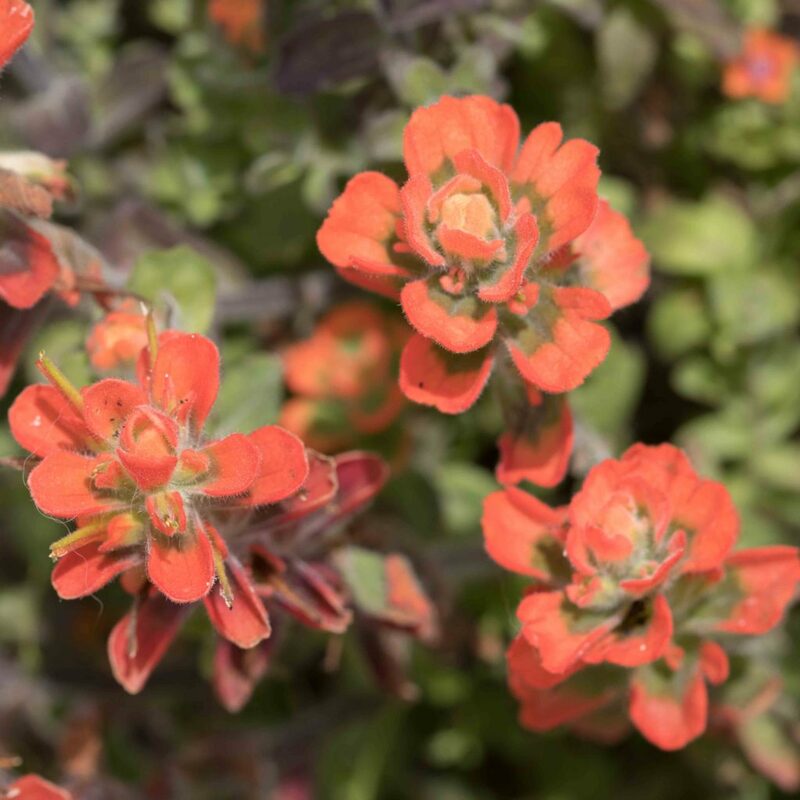 What appear to be petals are in fact bracts. 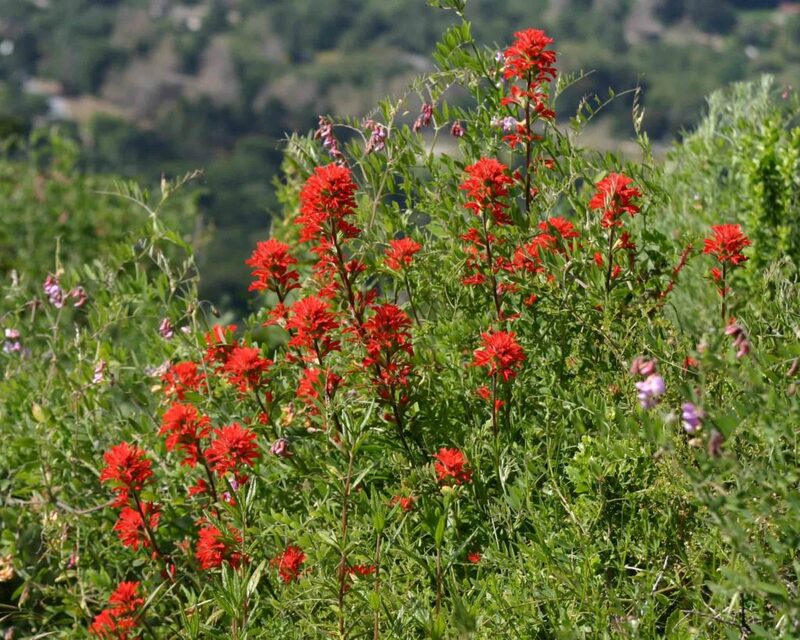 The flowers are thin green tubes (red on the underside) that extend out of the red-tipped green calyxes. 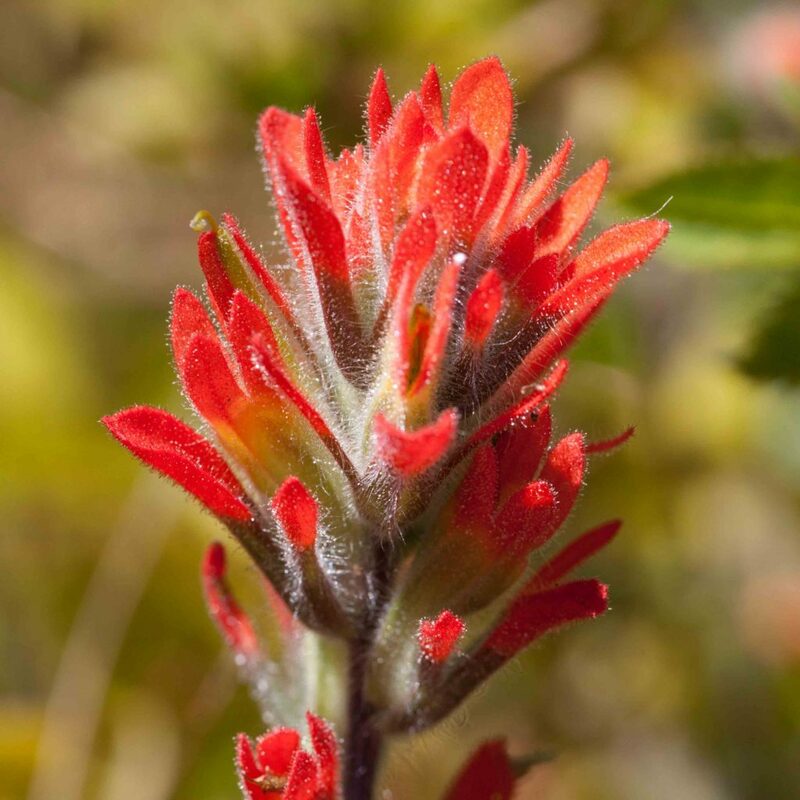 This is similar to Coast Indian Paintbrush (Castilleja affinis), but the inflorescences is consistently bright red and the plant is more branched from a woody base. Stems are glandular below the inflorescence. 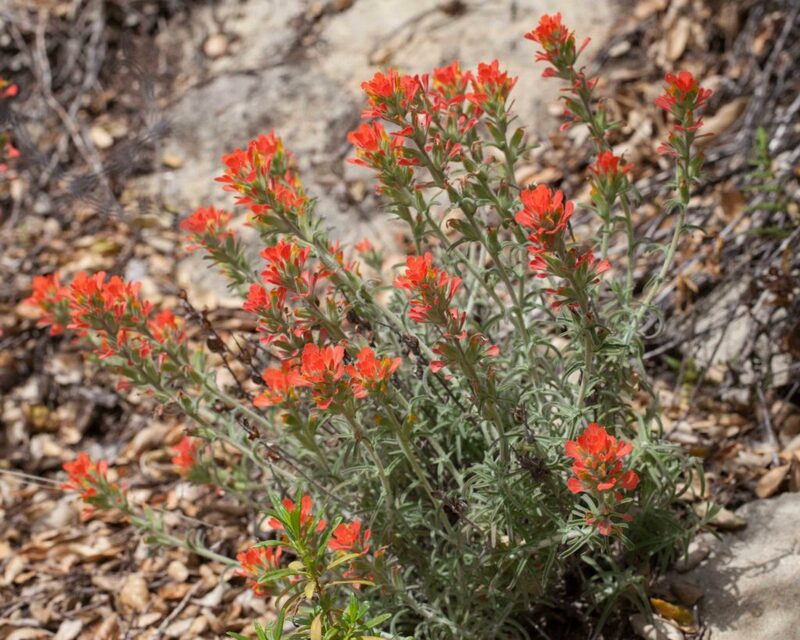 Leaves are usually unlobed (but may have up to 3 lobes) and are noticeably crisped whereas those of Coast Indian paintbrush are merely wavy. 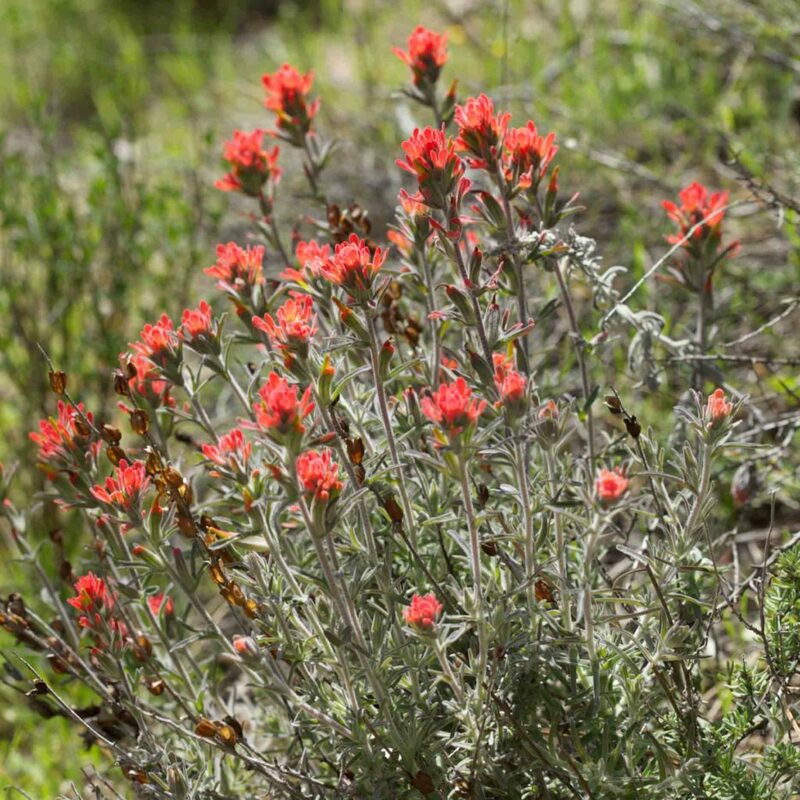 This is also similar to Coast Indian Paintbrush (Castilleja affinis), but distinguished by the woolly hairs on its stem, leaves and bracts which give the plant a whitish-gray appearance. 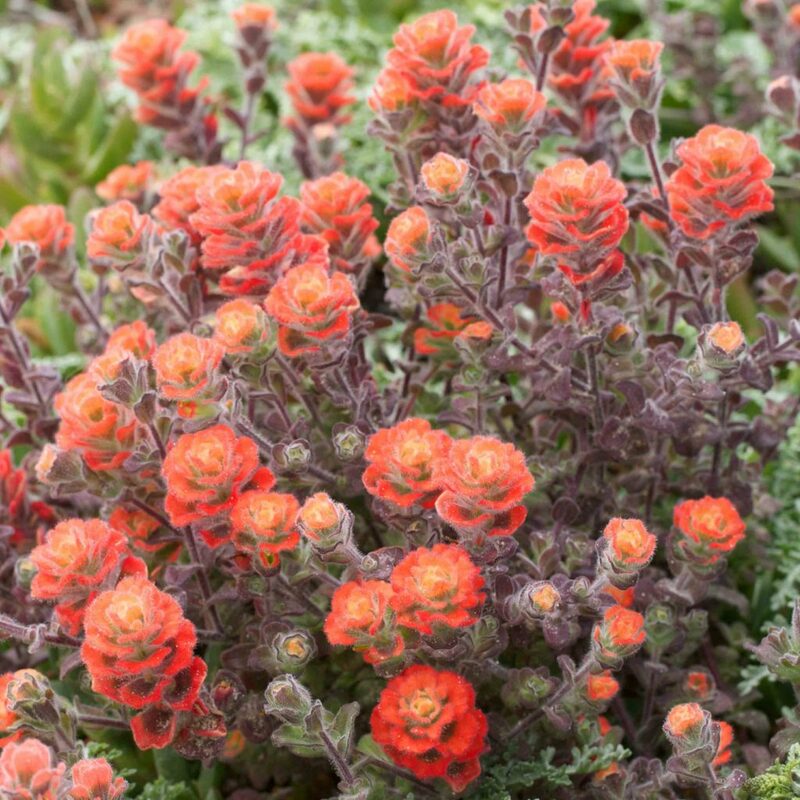 Although the inflorescences may be bright red, they are also commonly reddish-orange or even yellow, sometimes on the same plant. 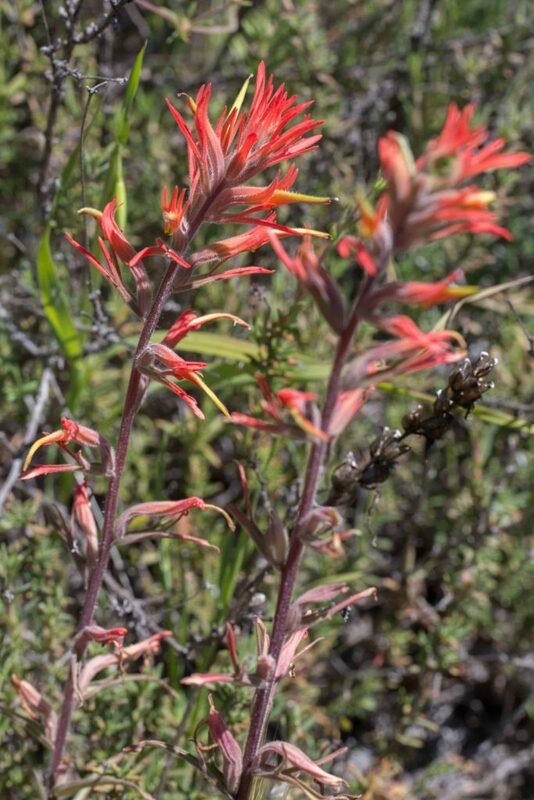 This is the most common paintbrush by the immediate coast, distinguished by its bracts which are broad, wedge-shaped to obovate and generally unlobed. 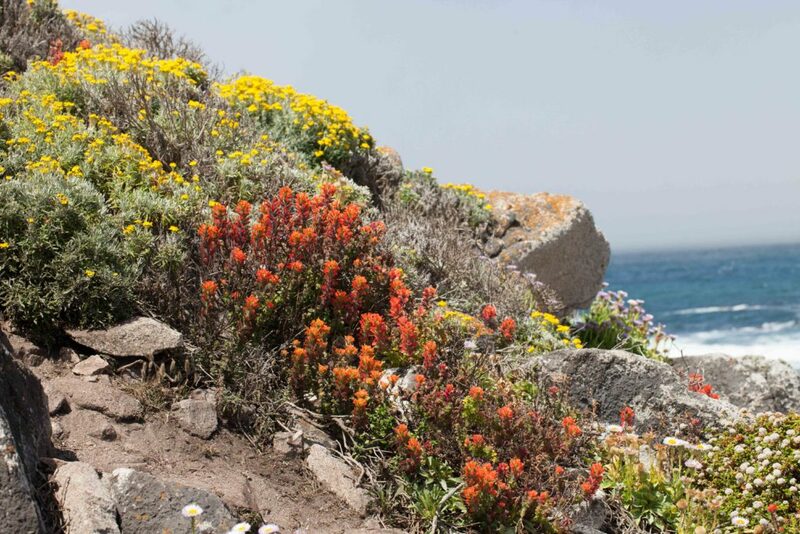 Inflorescences vary in color, from bright red to orange-red thorough to yellow. 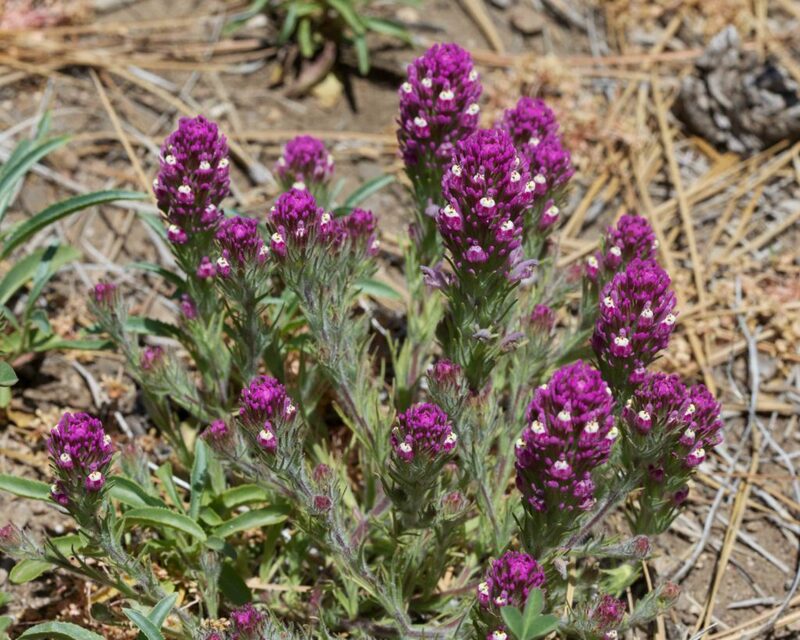 The plant is hairy, gray-green with short broad leaves becoming purple with age. 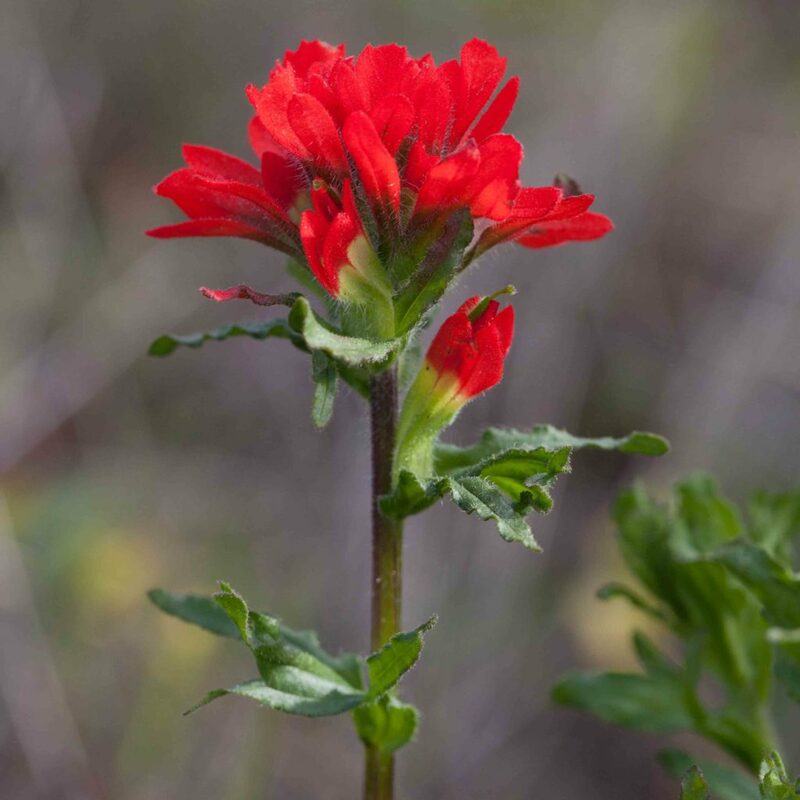 This paintbrush (found in Monterey County only in the Inner Coast Ranges) is distinguished by its calyx which is more deeply cleft on its lower side, revealing more of the lower corolla lip, and with upward-curving upper lobes. 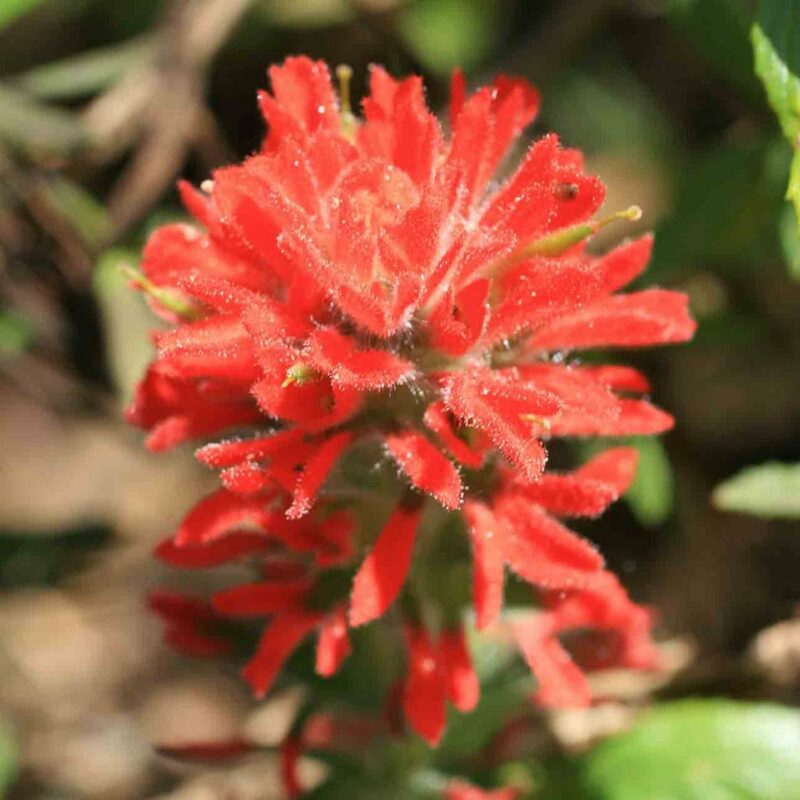 The inflorescence is less dense than those of some other paintbrushes. 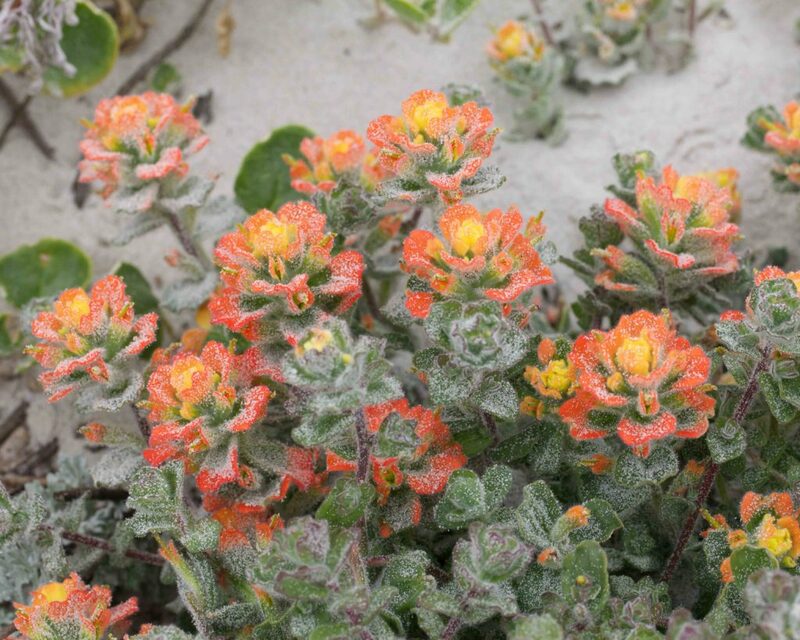 The plant is slightly hairy but not woolly. Leaves may have 0–3 lobes. 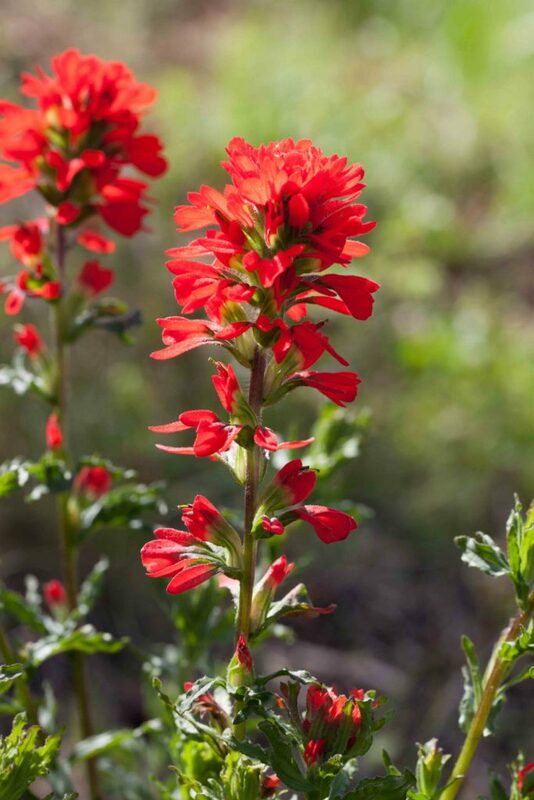 Bracts are generally entire wth bright red or orange tips. 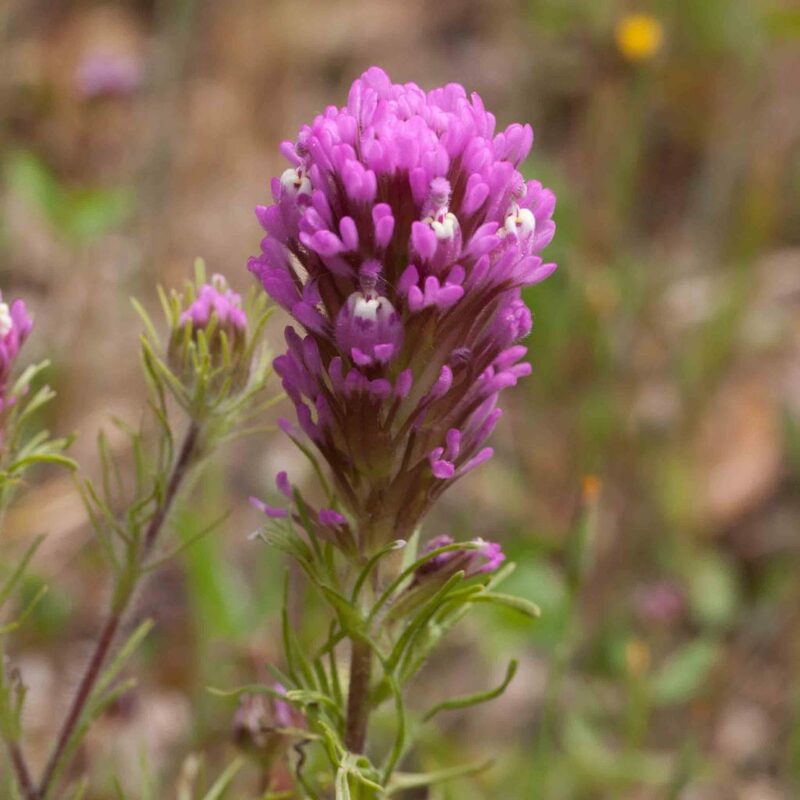 This is a form of Owl’s-clover, i.e. 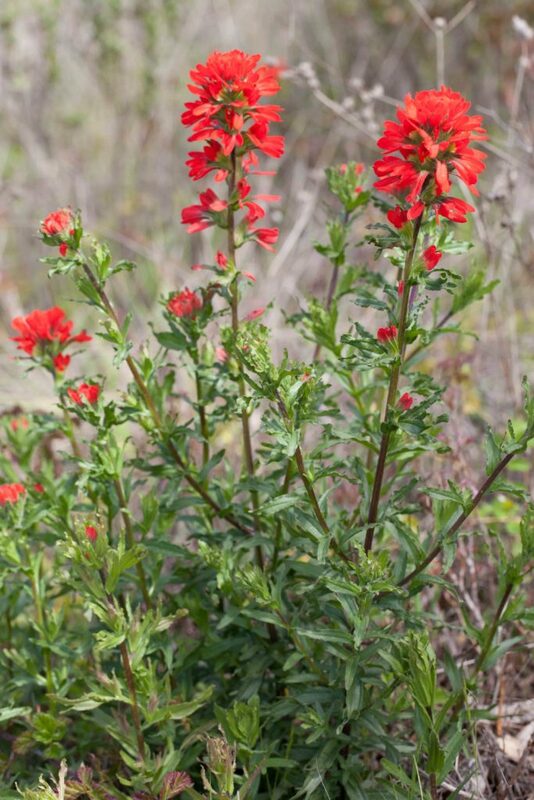 those Castilleja with 3-pouched lower corolla lip and flowers that are never bright red. 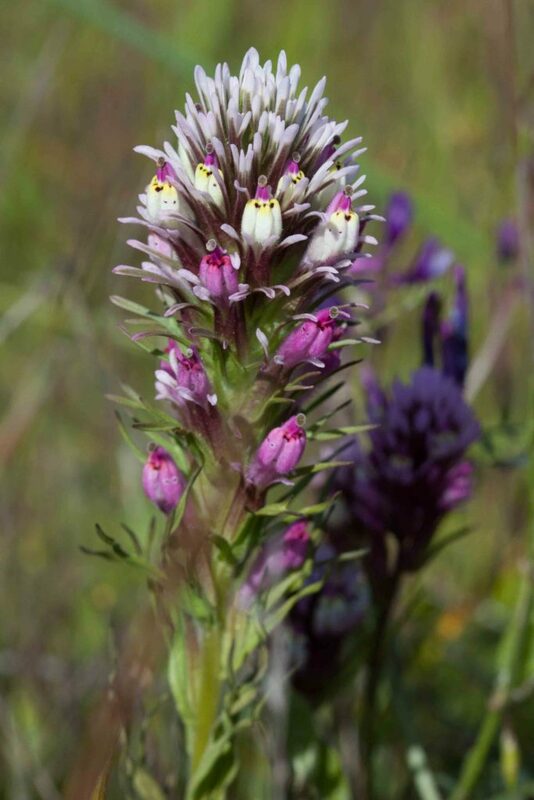 It differs from other owl’s-clovers in its many-branched growth habit and the color of the tips of its bracts. 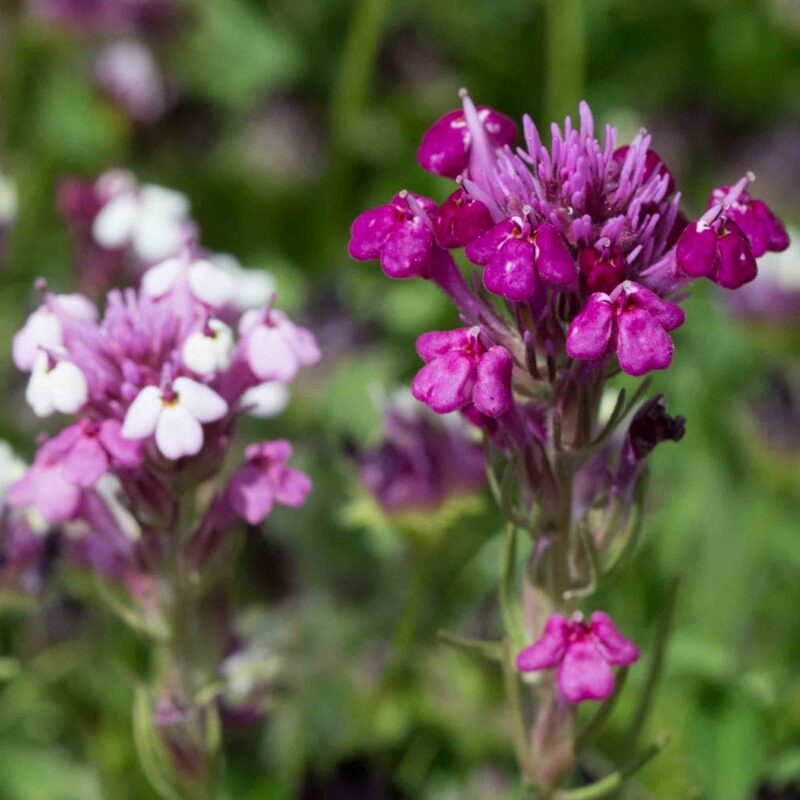 There are two subspecies (ambigua and insalutata) which are differentiated by the color of their corollas and bract-tips and also by the length of the tooth that is exserted from the top of the lower lip pouches. 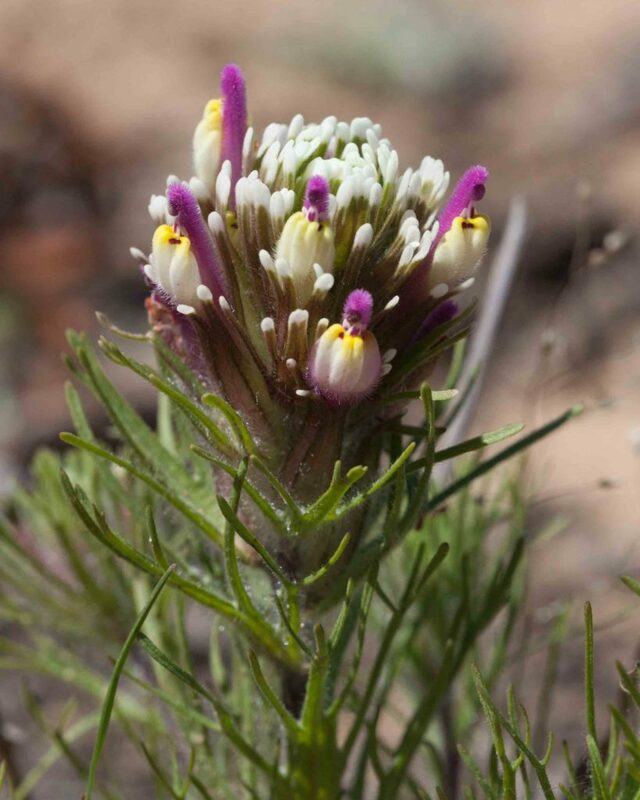 The Jepson Manual comments that this species is highly variable and difficult. 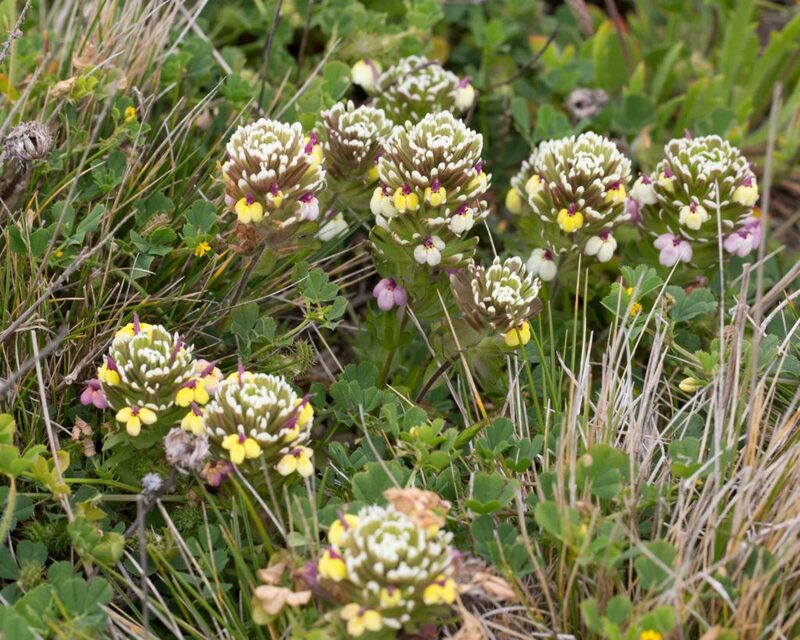 The plants illustrated below are believed to be subsp. 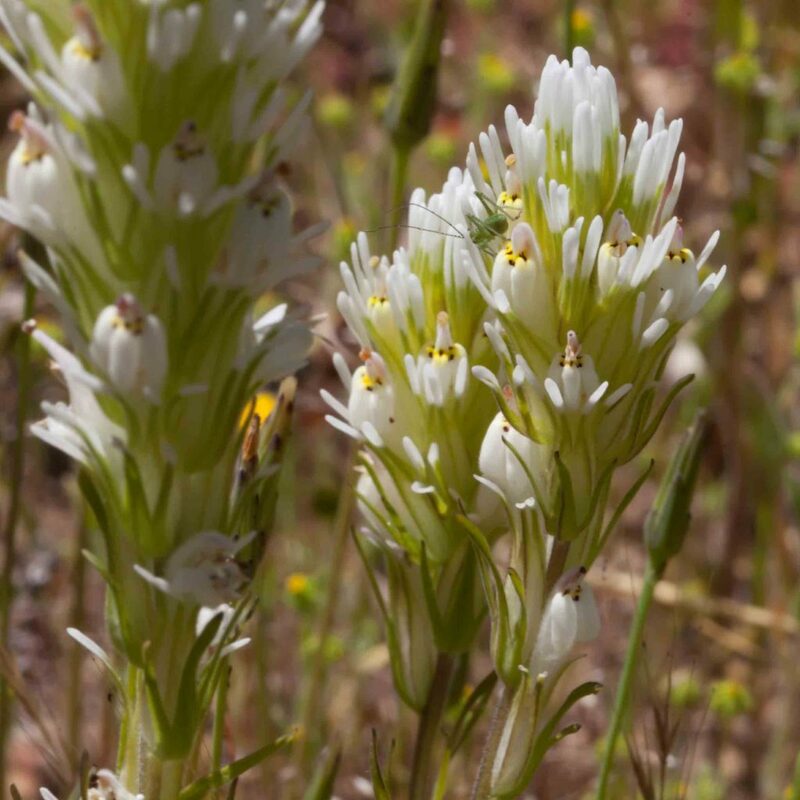 insalutata (despite being identified as subsp. ambigua in Yeager & Mitchell). 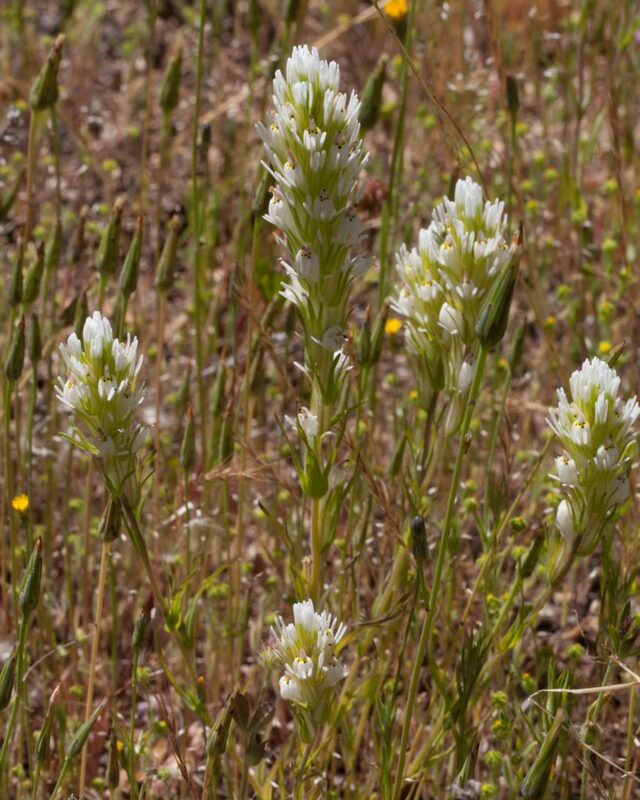 This is the only Owl’s-clover with white rather than pink or purple flowers. Leaves are long (2–8 cm), more or less linear with 0–3 lobes. 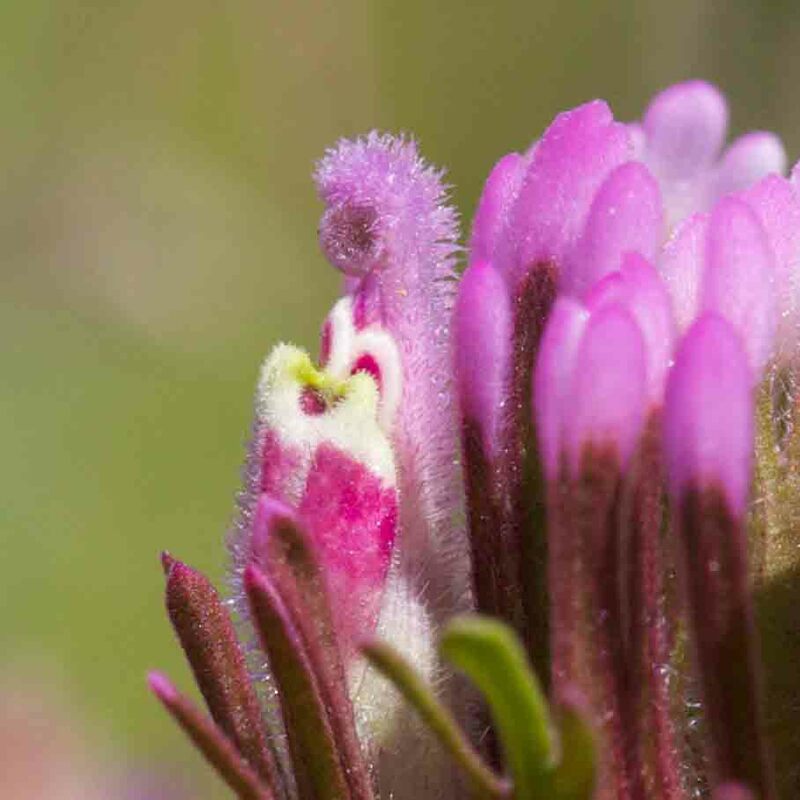 The tip of the galea (the upper lip of the flowers) is straight and not noticeably hairy, features it shares with Denseflower Owl’s-clover (Castilleja densiflora). 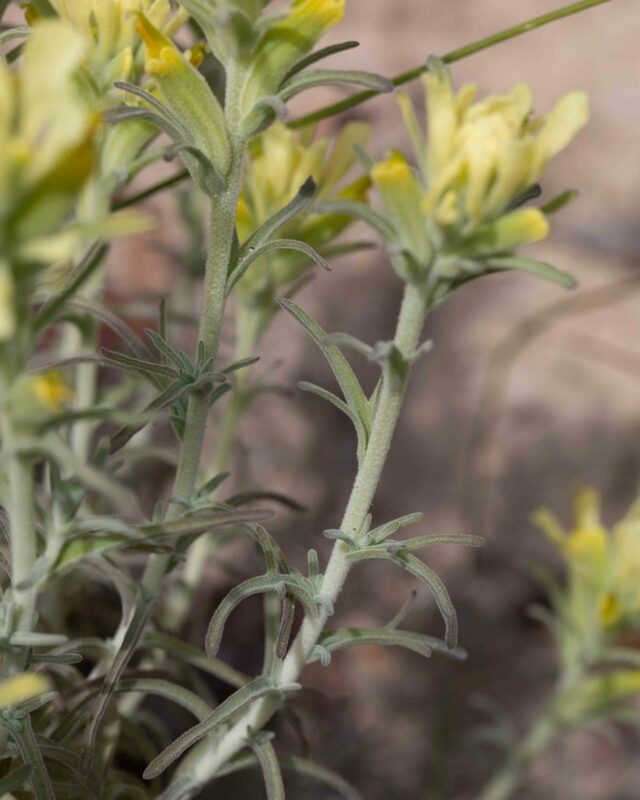 Bract tips are either white or yellow with yellow or purple dots. 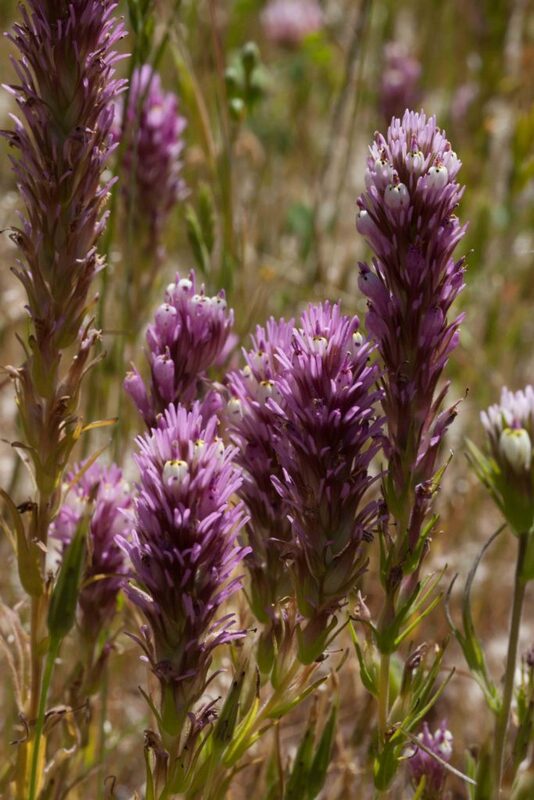 This is similar to and could be mistaken for Purple Owl’s-clover (Castilleja exserta). 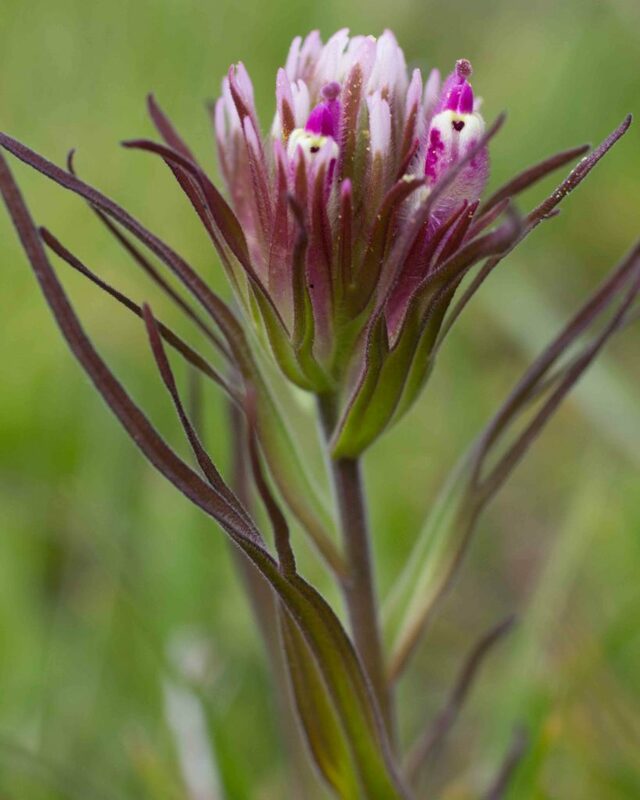 It is however slimmer with longer, linear (but not thread-like) leaves (2–8 cm) with 0–3 lobes. 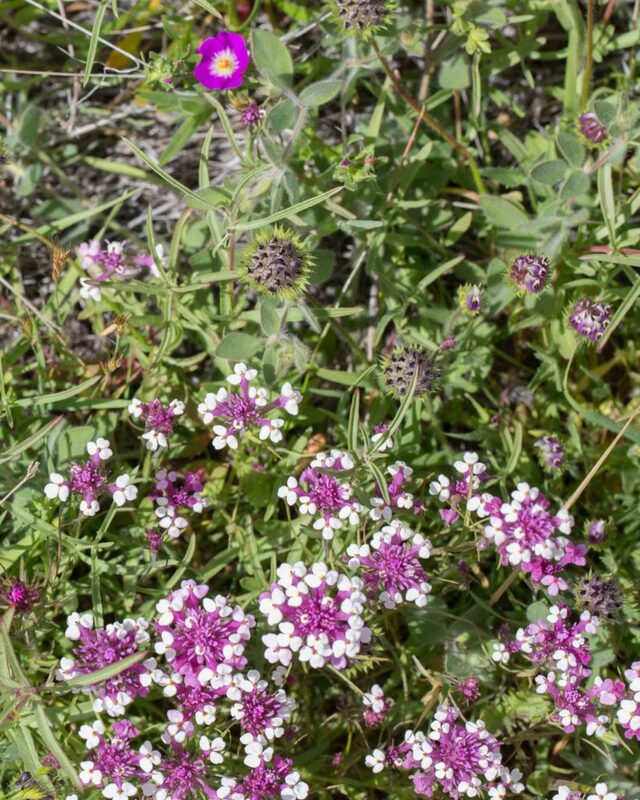 The most apparent difference (on close examination) is in the very different appearance of the galea (the upper lip of the flowers); these are straight and not noticeably hairy. 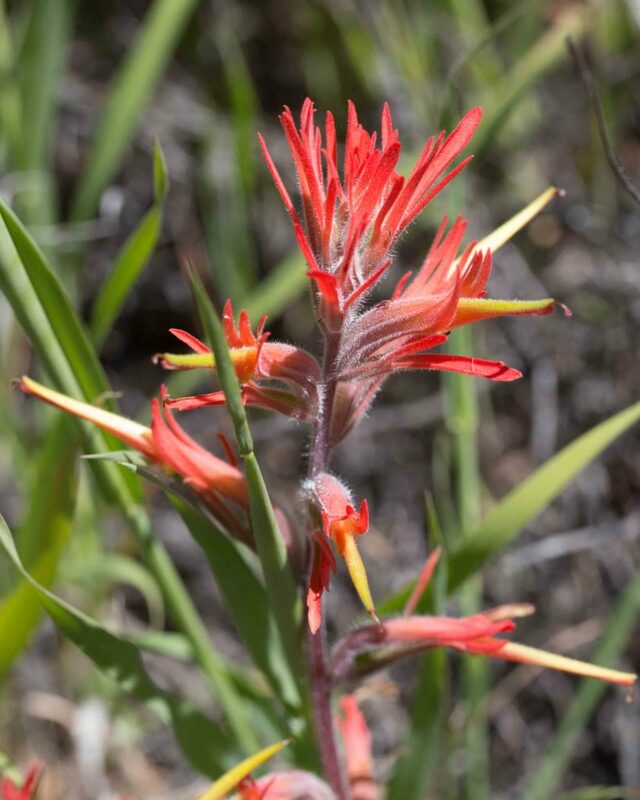 The bracts are more or less as long as the flowers. 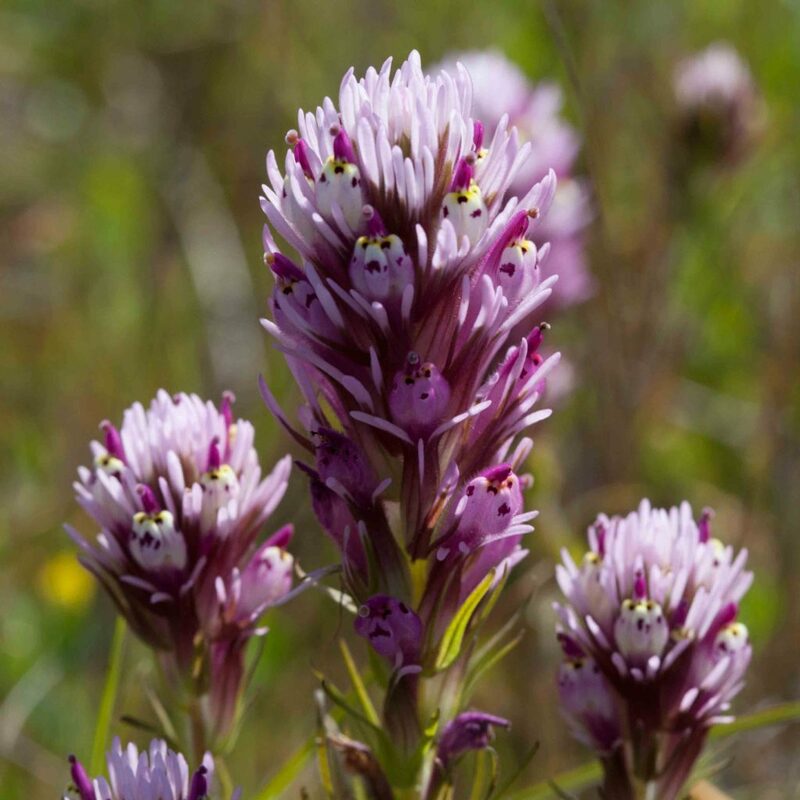 Although the same species as Denseflower Owl’s-clover (subsp. 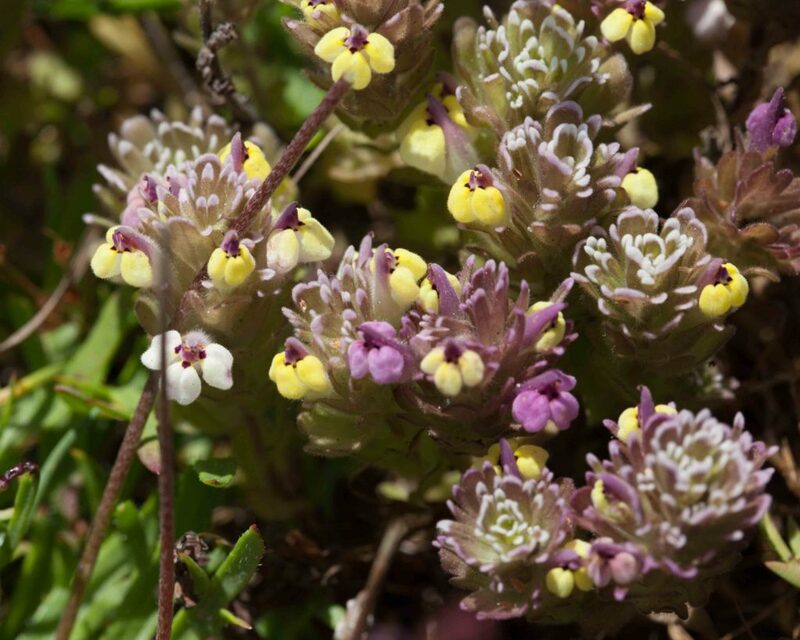 densiflora), this is surprisingly different in its appearance. The corollas are exserted with an abruptly inflated lower lip and a shorter calyx. 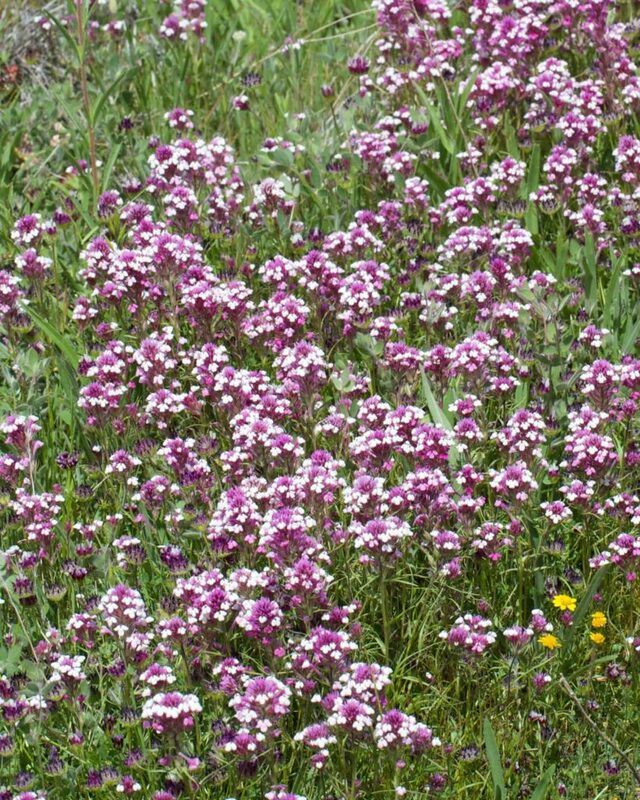 The lip is generally white but deep pink forms are not uncommon. 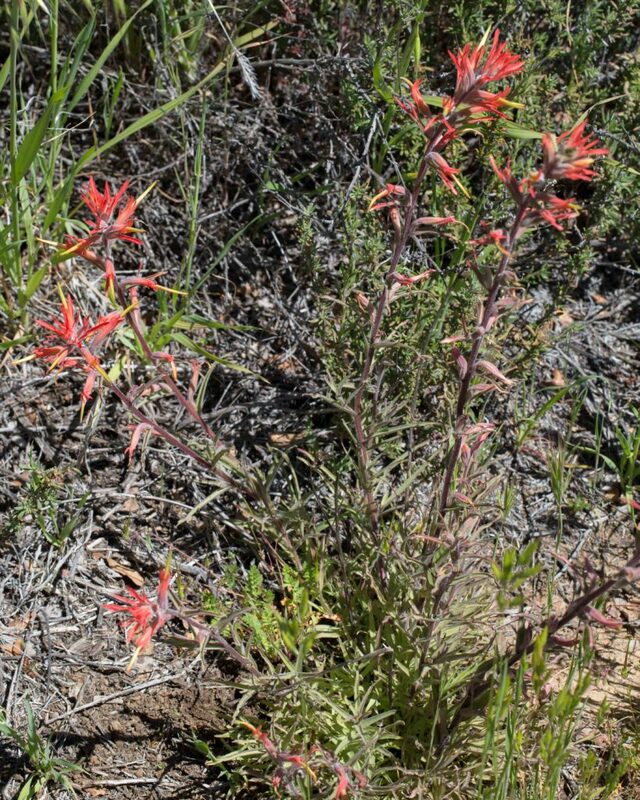 The bracts are shorter than the flowers. 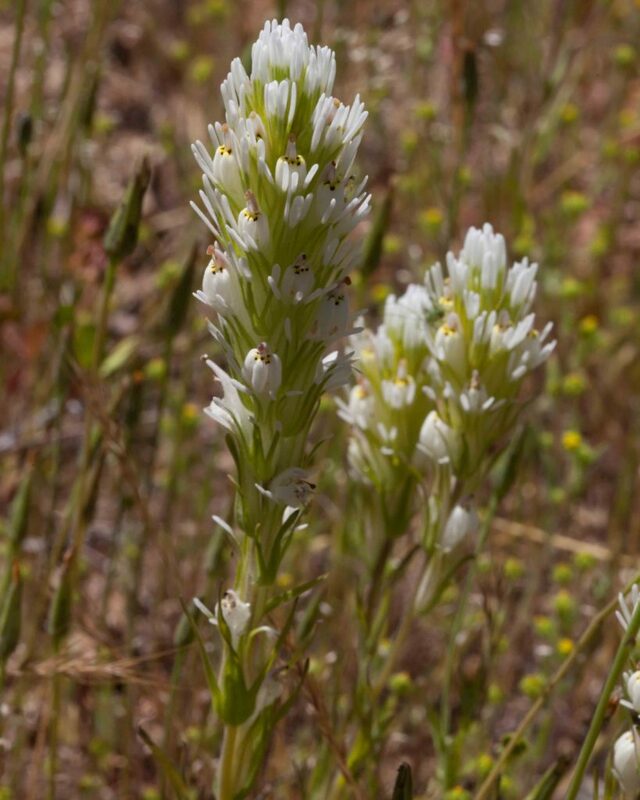 Common on Fort Hunter Liggett and the Indians. 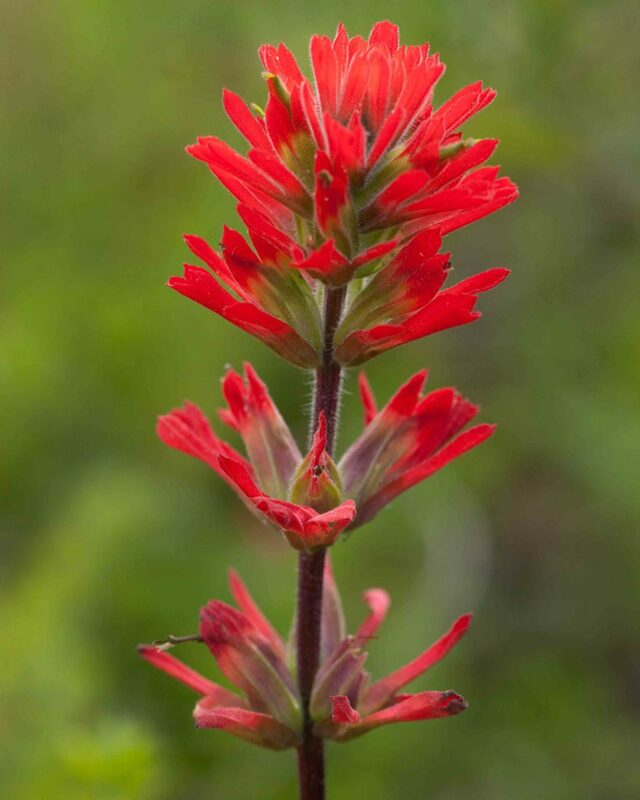 The most common form of owl’s-clover, this is typically broader than Denseflower Owl’s-clover (Castilleja densiflora subsp. 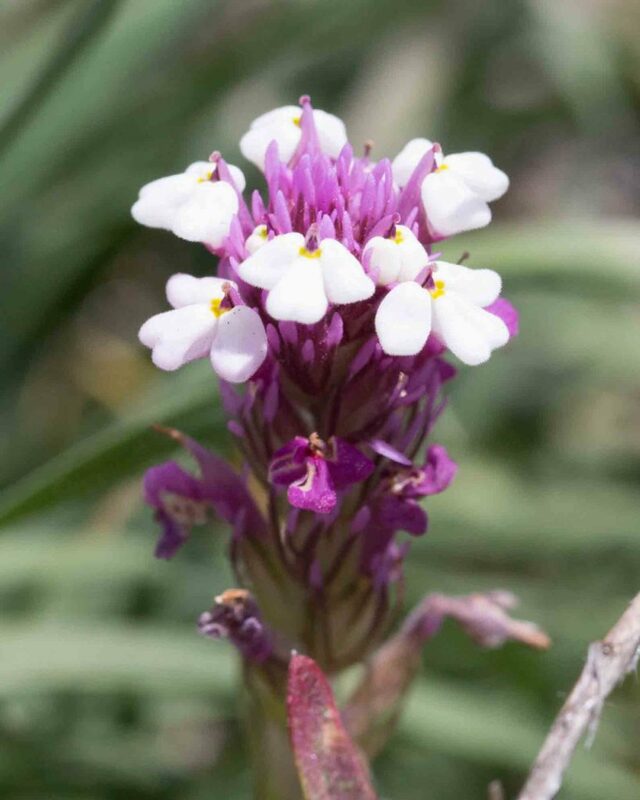 densiflora) and has flowers that can range from white to the more usual purple-red. 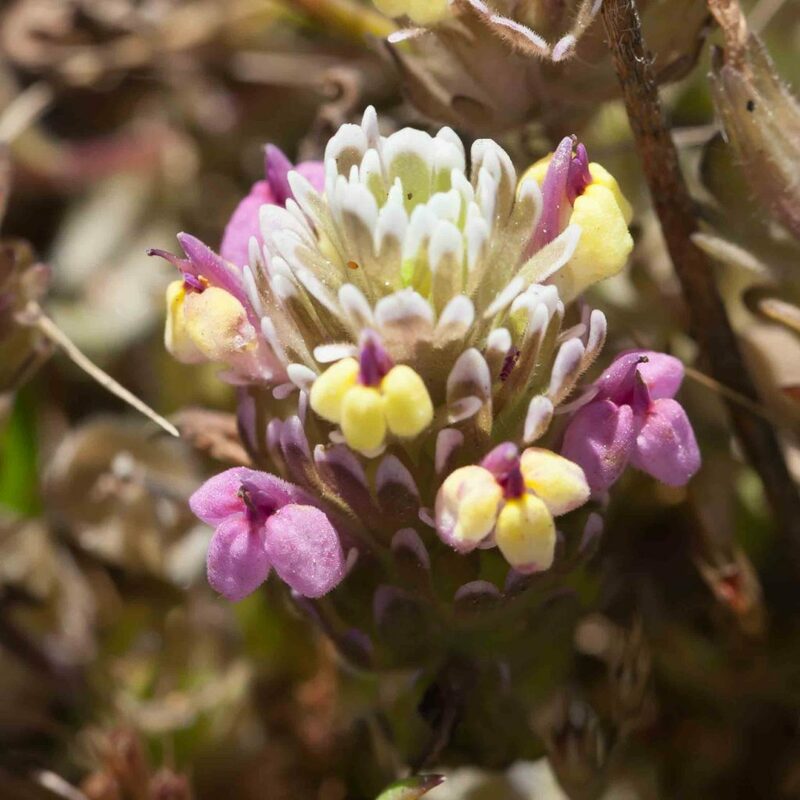 The two species can be distinguished by the very different appearance of the galea (the upper lip of the flowers) which are noticeably hairy and hooked and the leaves which are a little shorter (1–5 cm), thread-like and with 5–9 lobes.